This Daniel plan features an immense great room, a well-appointed kitchen with gourmet features, private study and a luxurious master suite with oversize walk-in shower and large walk-in closet. This plan personalized with the Tech Center and extended kitchen cabinets, french doors in the study, bay window in the master and coffered ceiling in the great room and master bedroom. It also includes a 4-car insulated garage, 10 ft ceilings on main floor, rounded corners, and 8 ft doors throughout. A finished basement and large covered patio completes this home on a lot backing to open space. Crystal Valley Ranch has much to offer with miles of trails, wide open vistas, multiple parks, the pinnacle recreation center that includes a fitness center, and the community pool and clubhouse. Also, conveniently located near historic downtown Castle Rock. There is still time to select finishes at the Richmond American Home Gallery. 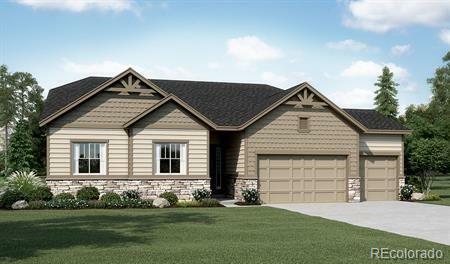 This home will be available Fall of 2018.